At 8:10 a.m. on November 21, 1916, teenager Leonard George didn’t have any idea his life would end within the hour. Why should he have thought so? It was a beautiful morning on the Aegean Sea, and HMHS Britannic had yet to pick up thousands of wounded and ill soldiers waiting in the port of Mudros to be transported home to England on the hospital ship. Captain Charles Bartlett had entered Kea Channel, aware there was always a level of danger when in a war zone, and confident he, his crew, and the ship were prepared in the event of an emergency. This would not be the only mistake made in the chaos of that morning’s tragedy, and nearly 100 years would pass before the truth of what happened became clearer. In actuality, this story began not in 1916, but in 1907 when a man revealed his dream to build a giant of a ship. The need and desire for bigger and better ships was a constant through the centuries as design and technology brought changes with each new seaworthy idea. By the early 1900s, the world entered the Golden Age of Ocean Liners, a period lasting until the late 1940s. Hundreds of thousands of immigrants, business and leisure travelers, and cargo, to include mail, all required passage, and as is the way of any industry, rivalries were commonplace. The back-and-forth competition between the two English companies Cunard and White Star Line reached a new peak in 1904. Cunard stated it was building Royal Mail Ship (RMS) Mauretania, reported to be 790 feet long and 88 feet wide, and Lusitania, at 797 feet—the largest ships afloat. Cunard routinely boasted a faster Atlantic Ocean passage than White Star Line, and with the successful launch of RMS Mauretania in 1906, White Star Line President Joseph Bruce Ismay felt the pressure of falling behind. Lord William Pirrie, Chairman of Harland & Wolff Shipbuilders in Belfast, Ireland, revealed a solution after dinner one evening. The unique relationship of trust between the shipping company and the shipbuilder reached back to 1869 when Thomas H. Ismay founded the company. In his book, The White Star Line, historian, author, and noted lecturer Paul Louden-Brown, explained the two companies had established a compatible financial arrangement and for fifty years, there was virtually always a White Star Line ship under construction in the Harland & Wolff yard. With this long-established history of performance and personal friendship of the two men, Pirrie confidently told Bruce Ismay he could build him a 1,000-foot-long ocean liner. More than a pride factor was involved in being able to bring about such a vision—this proposal was sound business. The clamor of immigrants wanting to seek new lives in America came with the willingness to pay, and the number of passengers they could accommodate in any given year was simple mathematics. In order to transport more, it required either multiple, faster, or larger ships. Each ship came with operating costs, and trying to match Cunard’s speeds had proved to be problematic. That left size. Pirrie’s new ships could carry up to 3,000 passengers with the third class paying for the cost of operation. Based on those calculations, second- and first-class passengers as well as cargo services would generate all profit, and what better way to entice higher paying passengers than to offer a greater level of luxury? To those who could afford it, the Olympic class of ship would provide such a degree of comfort, passengers would be willing to trade an extra day or two at sea. However, two to three ships would be required to guarantee weekly transatlantic service. 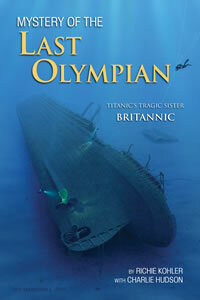 Thus, in the library of Pirrie’s home, the breathtaking idea of the Olympians—Olympic, Titanic, and Britannic—was forged. The agreement to accomplish design and construction of the largest ship in the world in not quite three years was almost as stunning as the concept. Pirrie had to scale back his ambitious 1,000 feet due to constraints of his Belfast shipyard dock that couldn’t be expanded to handle anything larger than 900 feet. Even with the reduction, it was like nothing he or any of the men involved with design or build had ever seen. Simon Mills, who is a, if not the leading expert about Britannic, described these details in his comprehensive book, Hostage to Fortune. The height from keel to the top of the four funnels would be around 175 feet, and the gross tons would exceed 45,000. The triple-expansion steam engines would be fed by twenty-nine boilers installed in the cavernous interior of the ship away from the eyes of travelers. Neither would the public see the fifteen transverse bulkheads that created compartments isolated from each other when closing special watertight doors. This safety feature served to make the ships practically unsinkable—or so it seemed. Passengers, even down to third class, would enjoy more spacious accommodations than on previous vessels, and first-class passengers could book parlor suites outfitted with the finest of furnishings, a bedroom, a sitting room, a bathroom with a toilet, and a wardrobe room. Oil paintings would grace the walls, and the grand staircase would feature large glass domes, bronze cherubs, candelabra, and other intricately handcrafted details. Artistry would layer spectacular naval engineering. Massive ships cannot be built without massive logistics and infrastructure, and it was not only Harland & Wolff who committed to modifying their shipyard to prepare for the enormous challenge. A special deepwater dock at Southampton, England, was to be constructed and the dock in New York City would likewise require extension. It was July 1908 when approval was given to take the dream of the Olympians from paper to reality. On December 16, the keel was laid with her sister Titanic slated to begin the following March. Twin 900-foot-long slips would allow simultaneous work on both ships, known by Hull 400 and Hull 401. Expansive scaffolding stretched the length of the ships and soared into the air in order for men to work without having to lose time repositioning their work platforms. The workforce of almost 14,000 was a mix of seasoned veterans, new hires, and young boys engaged in various duties. Despite the definite celebrity status of the Olympians, there were multiple ships in various building stages, and the total workforce that moved in and out of the shipyard was closer to 15,000 as the pace to complete Olympic and keep Titanic on schedule never slackened. Engineers with the finest education of the day joined men with dirt and grease embedded under their fingernails as the clang of metal rang continuously and smoke billowed from furnaces accompanied by the lying of the keels. Tens of thousands of hands-on steps had to be performed to make the 20,600-ton hull ready. Well-known for hosting impressive launch ceremonies, the one Pirrie planned for Olympic was to surpass anything he’d done in the past. Pirrie could not order the weather of October 20, 1910, to be sunny and calm, and yet, it was as if Mother Nature herself blessed the launch. Almost 100 reporters scrambled among dignitaries to gather the news they would blast around the world of the marvelous ship soon to slip into the Lagan River where thousands of people lined the banks, waiting to cheer. The first noise arose from two rockets fired as warning in the unlikely event some vessel on the river was unaware of the launching. Ten minutes later, the third rocket was quickly followed by Pirrie’s command to release Olympic from her restraints. The prolonged cacophony of whistles, applause, bells, and horns signaled the success. Olympic slid into the water, entrusted to the five tugboats it required to guide her to the outfitting wharf where workers would spend seven months to complete the interior of the ship from the most mundane fitting in third-class berths to the elaborate Turkish baths. Wealthy passengers accustomed to fine hotels would find nothing lacking during their voyage. The unrelenting pace to make the ship ready for her promised maiden voyage culminated in her sea trials May 2, 1911. Three thousand tons of coal and a crew of 250 men commanded by Captain Edward Smith made the two-day run to Liverpool and Southampton. Thomas Andrews, Pirrie’s nephew and a naval architect, had taken on engineering responsibility for Olympic when Alexander Carlisle, Pirrie’s brother-in-law and chief naval architect, resigned a year prior. With the successful sea trials behind them, Olympic departed to be readied for her maiden voyage. The majestic entry of Olympic into New York Harbor June 21, 1911, was met with the fanfare the 882-feet-long and 45,324-gross-ton ship deserved. Headlines announced her arrival and a special, colored postcard was drawn to commemorate her profile. The wealthy passengers who helped provide pure profit for Ismay had praised the splendid first-class lounges, smoke rooms, libraries, vast promenade and sport deck spaces, the gymnasium, and indoor swimming pool. Huge chandeliers had cast light, and they had dined sumptuously in gracious restaurants from specially commissioned china and crystal. The luxury promised had been delivered, and the opulence of Olympic, at least for the moment, had strong appeal among the highest-paying tier of travelers. The sister ship Titanic was on schedule for completion, and construction of the third ship, Britannic, was set to begin later in November. Rumors swirled about additional grandeur in the third ship, and the name Gigantic made its way into several publications. Whether Gigantic had ever been officially considered was a source of debate, but speculation was correct about the plans for added luxuries such as enclosing the upper promenade with sliding glass. Bruce Ismay, ever aware of the threat of his competition, knew his magnificent Olympic Class liners fulfilled the dream Pirrie had offered him. What he didn’t know was the maiden voyage of Titanic was to be disastrously different from the glory of Olympic. Nor did he know there was a young woman serving as a stewardess among more than 900 crew members of Olympic whose destiny would seem oddly linked to tragedies the future held.